I have mentioned before that I am from a moderately sized town in Northern West Virginia. However, though we are a big town for the state, we are still pretty small. There isn't a lot to do around here if you want to go out with your friends, and there is even less to do if you are not into the bar scene. That is why, when I get together with my girlfriends, we like to have, what we call, girls nights in. Last night was one such night for me. This is me on the left, and one of my besties Jessica on the right. She and I met about 8 years ago, while working together at a local Christian school. We discovered early on that we both shared a deep passion for books and the rest is history! She is a little crazy, but a good time is always guaranteed when she is around! She recently moved into a new apartment, and has been wanting me to come over, so we could break in her new kitchen! We set the date, and I asked what was on the menu? She said to me "Well, there is this soup at Olive Garden, a chicken "ganacky" soup. It has spinach in it." I laughed and said "You mean a GNOCCHI soup?" She replied "Yeah! Do you think we could make that!?!" I said "Sure, I just tried that the other day actually, and it should be really simple." She said, "Do you think we could find a recipe for it online?" and I said "We don't need a recipe. I know exactly what is in it!" She was skeptical, but at the end of the evening the soup was AMAZING and spot on too! I can't wait to share with you how we did it! Now, first things first! For any girls night to be successful, you have to have great music! For us is was Flyleaf's First Album. It is a record that is near, dear, and a little sentimental to us so it was perfect! I started the roux, the base of our soup. Except wait! We forgot the onions! No worries, we will just use onion powder. As Julia Child Said "It's just you alone in your kitchen. If you mess up, who's to know!" I whisked the flour into the garlic and oil until smooth, and let it cook a couple minutes. This is a roux, the base of any creamy soup! Now it is time to add our stock. Remember, 1 tsp. per 1 c. of water. I whisked it all together well, and brought it to a boil. Once boil I added the spinach. I let that simmer for another 5 minutes, to let the chicken heat through. or roast them at 375 for 20 minutes. Which ever works best for you. Now it is time to add the gnocchi. Hey, I don't judge you, you don't judge me! Let that simmer for 4-5 minutes and your soup is ready to go! And here it is! 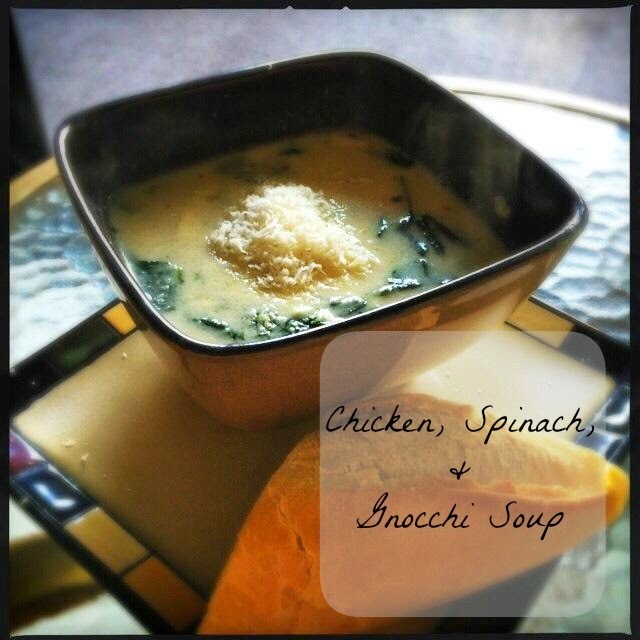 a DELICIOUS Chicken and Gnocchi soup with Spinach JUST like Olive Garden makes. Heck, I dare say better! After dinner, we talked a little, did a few other things, and then...Jessica made me watch the movie, who's theme song has driven me mad, because it is everywhere!!! See, you don't have to go out to expensive restaurants, bars, malls, or the movie theater for a great night with your friends! Food has a way of bringing people together! You will laugh, maybe even cry, you will talk, and you WILL take pictures, but best of all, you will make memories! So this weekend, make it a night in, whip up this great soup, and get crazy with your best friends! OH! PS- Stay tuned tomorrow for part two of this girls night in where Jessica and I will tackle dessert! Place Dutch oven over medium-high heat. Add the 1/4 c. of oil. Add the onions and cook until soft and translucent. Once the onions have become soft and translucent, add the garlic. Cook until you smell it coming from the pan. Add the thyme and sage, whisk into the oil. Whisk until the flour has become incorporated into the oil and is smooth. Let cook for a couple minutes to get rid of the raw flour taste. Now add the chicken stock and bring to a boil. Once boiling, add the spinach. Drop to simmer and let simmer for 5 minutes. After 5 minutes, add the chicken and milk. Let simmer for another 5 minutes. Add any salt and pepper your dish may need to suit your palette.